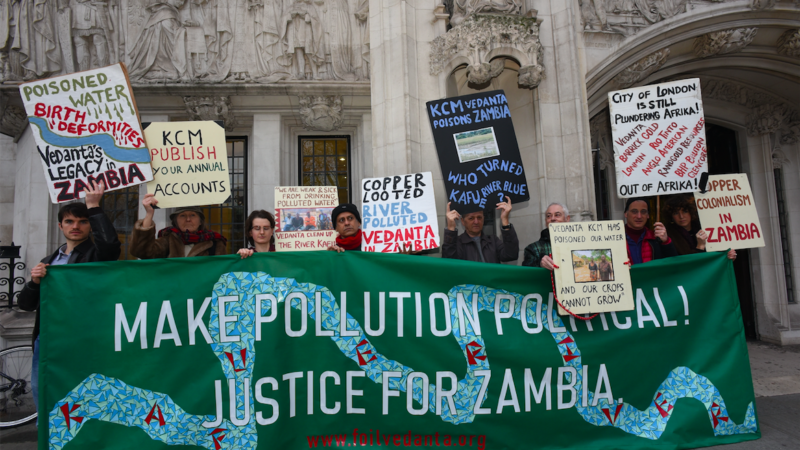 A British mining company is in court today arguing that it is not responsible for its Zambian subsidiary poisoning 40,000 people. UK mining firm Vedanta Resources bought a Zambian company called Konkola Copper Mines (KCM) in 2004. After this purchase, farming and fishing communities downstream of the copper mines claim to have suffered continual pollution. Two thousand of these people took KCM to court in Zambia in 2007. The courts found KCM guilty but denied the communities compensation after a nine year legal battle. So the victims took their case to UK lawyers Leigh Day. Vedanta is trying to evade responsibility for its subsidiary’s actions, arguing that it did not control KCM and therefore does not have a duty of care for the people polluted by its mines. Both the High Court then the Court of Appeal rejected this, ruling that the case should be heard in the UK. Today in the Supreme Court is Vedanta’s third attempt. The case could set a precedent for ‘duty of care’ owed by a UK parent company to communities affected by a foreign subsidiary. “Villagers along the River Kafue as well as Chingola residents have suffered severe pollution of water sources ever since Vedanta took over the mines. Despite our twelve years of legal campaigning in Zambia, nothing has been done to improve the desperate situation for the most affected communities, where land is poisoned and people are very sick. In a further development Vedanta Resources de-listed from the London Stock Exchange on 1st October 2018, amid global protests following the killing of 13 people, shot by police during protests against the company’s copper smelter in India. To handle publicity, Vedanta have employed RLM Finsbury – the PR firm founded and chaired by Amber Rudd’s brother Roland. They did not immediately reply to a request for comment.